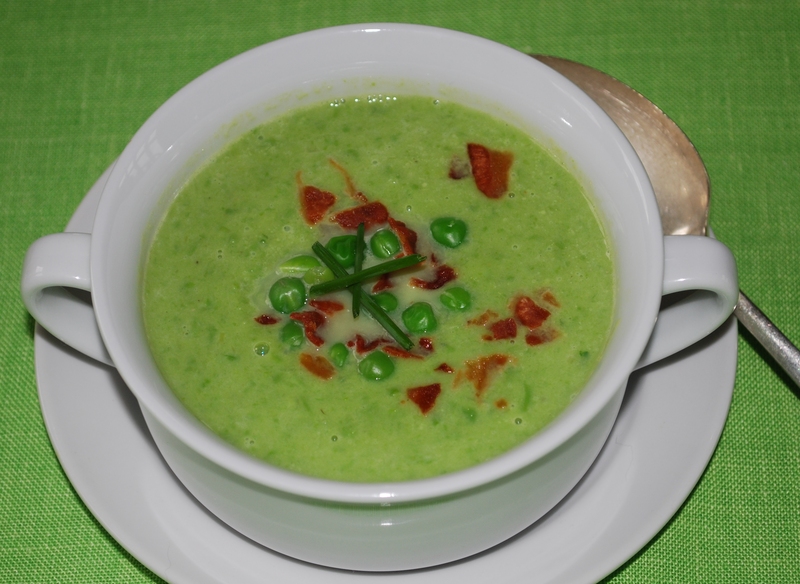 Spring inspired ingredients are used to create this simply delicious soup! It can be a great starter or a meal itself – you choose! If you can find fresh peas they are best to use, but frozen ones will taste wonderful as well. I chose to top it with bacon, but ham is a good substitute too. Serves 4 as a starter and 2 as a meal. In a large pot heat 2 tablespoons of butter over medium high heat. Add leeks and sauté for about 5 minutes. Add sugar and sauté for about 5 minutes or until edges of leeks begin to slightly brown. Add chives and sauté for about 30 seconds. Add peas (reserving 2 tablespoons for garnish), broth and a dash of salt and pepper and bring to a boil. Lower heat to low and simmer for about 15 minutes to blend the flavors. Blend soup in batches to a smooth consistency and add back pot. Over low heat whisk in the half and half and 1 tablespoon of butter. Simmer over low heat for about 10 minutes – 15 minutes. Taste and adjust seasoning if needed. Peas and bacon should be warm. Individually warm peas and bacon in microwave if needed. Ladle into bowls and garnish with reserved peas, bacon and chives.